Paul Kornellison, a great friend of Sonshine Hacienda and Marketplace Missions came to San Felipe in September with a few good men from his church, Faith Community Fellowship, located in Mt. Vernon, Washington. 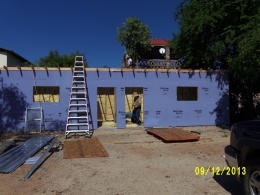 This was a group of men with a mission....to build new Sunday School rooms for Mission San Felipe Church. Over the past few years the church has been growing and most recently the church began having a Spanish service after the English speaking service each Sunday. What a blessing it has been to take our Sonshine children to church every Sunday where we can worship together with other families of the community. We are also blessed to have the children from the other Casa Hogar, Casa de Fe joining us as well. With all this wonderful change came a need for additional space for Sunday School rooms. So, we called our friend Paul and asked if he could help us out (building things is his area of expertise), and help he did!! The picture above was taken a few days before the team was ready to put the finishing touches on the building. The building is one long structure with two separate classrooms. These rooms will primarily be used for the children's classes on Sunday, but could also be used for meetings, Bible Studies, etc. during the week. We thank the Lord for these beautiful classrooms and send blessings to Paul and his team for all their hard work and sacrifices. For the past year and a half my life has taken some turns that I did not anticipate. When we opened Sonshine Hacienda I never thought that I would have as part of my responsibilities the day to day care of the children. I thought I would only be the Director and others would do the childcare. But life had some surprises for me....and also some blessings. Is it hard work? Yes. Do I wish often times that I could retire like other people over the age of 65? Yes! But will I quit? NO. Because I have experienced beautiful SACRED MOMENTS IN ORDINARY THINGS. It was so special the other morning to wake up our 12 girls at 5:30 am and tell them it was time to wake up and get ready for school. I called them Princess's & told them it was going to be a beautiful day for them. It was a sacred moment for me to see each one of them sit up in their beds, hair in a mess, smile at me and then get out of bed and give me a big hug while telling me they loved me. That was a sacred moment to me. Every Saturday I replace our Administrators for the day. 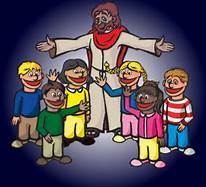 It is such a sacred moment to walk into the great room at 7:00 a.m. and be practically knocked over by the kids running to give me a hug and each one expecting a kiss or hug in return...that is sacred to me. The Lord is blessing me through these sacred moments. I thank Him daily for the gift of being able to see beyond the ordinary things and see the blessings that He is giving me each day. I am blessed. What's in a name anyway?? So, what is so important about your name? Well in Mexico, your last name is almost like your family tree. Both your father and mother's (maiden) name are part of your last name. Even though the children are separated from them for various reasons, it is a link to their parents that is important to them. 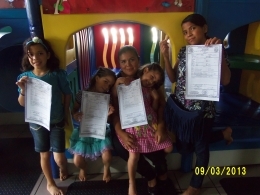 When we received Alexandra, Perla, Alondra and AdreanaBerumen Bravo at Sonshine Hacienda, none of them had birth certificates. It is critical to have a birth certificate in this country because you cannot continue beyond the primary grades without it or have access to Seguro Popular (like Medi-Cal) health care. So since May of 2012, DIF (Child Services) has been searching for the birth records of the "Berumen" girls. Finally we received word to come to Mexicali and have the girls fingerprinted. Upon arriving we discovered that the girls last names on their birth certificates were not Berumen Bravo, but Bravo Figueroa. The father did not bother to go to the hospital to sign the birth certificate documents (for all four daughters???). So the father's last name of Berumen is not on any of their birth records. Just the maternal last names of their mother are on the birth certificates. The girls were sad and shed some tears. It must have been like losing their Dad all over again. But disappointment is not a stranger to these girls. When we got to the Lawyers office, Alexa, 12 years old asked us if she could ask the Lawyer a question about her mother. She broke my heart as she introduced herself to the Lawyer and asked if she had seen or heard from her mother since they were picked up by the police. The Lawyer said no that she had not seen or spoken to her mother. My heart was breaking for her. Alexa is definitely one of my heroes. You hang in there Alexa...THERE ARE ANGELS SURROUNDING YOU!! 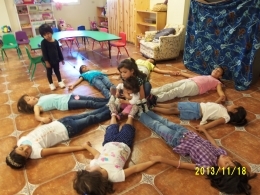 What a surprise to hear recently from DIF in Mexicali (Child Services) in September. They delivered to us some rather state of the art equipment which will help keep track of all the children in the custody of DIF. All the information for the children in our custody is entered into our system here at Sonshine as well as at DIF. Then each week, we need to have each child accounted for as present at our Casa Hogar by placing their finger print in a special apparatus that is included in all this equipment. Whoa, don't ask me to explain how this all works. There have been some glitches, but the bugs will eventually get worked out. Eventually this equipment will be capable of doing much more...conference calls,etc.. I asked why there was a need for this equipment and it was explained to me that some Casa Hogars have children run away and they don't even report it to DIF. THIS IS OUR VERSION OF A MEXICAN PLAY PEN. THE GIRLS LOVE TO PLAY WITH ANGELA.